Your comment about love or hate gay cruised being “binary” is a load of crud. Gays are the absolute most ageist and judge mental group to travel with . I recently broke down and gave into the experience after my 20 year relationship came to an end. I never felt so alone and isolated as if I were leper . At one point I i sat down at a crowded breakfast and as my but sat down the five gays at the table immediately stood up and left . I said good morning , asked if the seat was taken and was treated like I was in the junior high school cafeteria and tried to sit with the cool kids. I’ll never do it again and I’ve shared my story on my blog as well as other blogs and I rarely find anyone who raves about a gay cruise …I will say that straight cruises are more accepting and friendly if you must try the cruise venue. I only wish I could have somehow been able to get off that boat. Now on the same subject if you are 21-30..with lots of extacy and liquor then have at it you would have a blast . The reason some of the ports do not like gays is because the employees on these cruise see first had the abhorant behavior of the gay passengers and the staff lives and are citizens of those ports of call , don’t you think they talk about how grotesque gays seem to them ? Word spreads like a psunami and next thing you know we are all disliked at certain ports of call. All because of ill mannered flotsum . Sorry to hear about your experience — it’s definitely not typical of what we hear from our friends, colleagues and associates, and It sounds to me like you chose the wrong gay cruise — I’m curious if after reading our extensive advice in the magazine if you would have chosen the particular trip you did. In any event, thanks for sharing your experience. As a man in his late 50’s I sadly have to agree with Stephen, that single male travelers of a certain age are not widely welcome on many gay cruises(particularly if they are “on the prowl.”) I took one with friends when I was in my early 50’s (on a long established gay cruise sponsor whom my younger friends adore…) We did honestly feel too old for the crowd and for the atmosphere. That said a dear friend in his 80’s who is very young at heart had fun on one though he was treated as an oddity, and certainly did not get frisky…. Perhaps age, demographics, and interests trump “gay” in this wonderful evolving “post-gay” world for those of us no longer at the top of the sexual attraction heap. Demographics and interests are always a very important consideration when choosing traveling companions or a group. And indeed an all-gay cruise may not be the right choice for everyone. But even among all-gay cruises, there’s a big difference in atmosphere between an Atlantis Mexican Riviera cruise, which is heavily party-oriented, and their upcoming Singapore to Hong Kong cruise, and an even bigger difference between Atlantis’ offerings and the gay cruises operated by Source Events or Brand G, or a gay group like Pied Piper, which we explore and discuss extensively in the current issue of the magazine. It’s too bad you and Stephen didn’t have our advice available to you before you chose the cruise vacations you did. I never wanted to do a cruise, but my partner talked me into one and I saw the advantages [and disadvantages] of them. Now I’ve been on numerous cruises, on three different lines; none of them were “gay cruises”. [My partner has been on several gay cruises.] Of the three — Norwegian, Princess, and Azamara — the grey scale of feeling welcome varied. We have been on two Norwegian cruises, the first was fine and the second was uncomfortable and unwelcoming. Not from the staff, but from the apparently unsophisticated passengers aboard. Many of them seemed shocked merely by the sight of two men together. There was no PDA, by the way. Just seeing us walking down the corridor to dine would inspire pointed fingers and whispering. I usually approached the most hateful glances and “killed them with kindness”, greeting them and asking about their trip until their wary expressions turned into something more tolerant. We won’t be going on Norwegian again. We have had the best experiences with Princess. Well-attended groups, hosted by attentive ship officials [who are also gay]. Hosted champagne flowed, and events were scheduled. However, it doesn’t seem to be ship policy; but rather is up to the energy of the host. It’s volunteer work. Some get into it; others do not. I would recommend going on a regular cruise though. There are always enough “family members” on board, and we have made some really great straight friends as well. Thanks, Marco, for sharing your experience. Indeed, the sophistication and composition of the passengers on any given cruise can make a big difference. That’s one of the reasons gay charters became so popular. And great to hear you’ve made great straight friends — new friends are always a welcome bonus on a vacation, and seem to happen a lot on cruises. Thank you for starting this dialogue, and I look forward to expanded coverage as time goes on. I am 37, have been on 9 cruises, with Princess, RC, and Carnival. I actually leave today for my first cruise with Norwegian, and am booked on my 11th cruise with Celebrity this summer. Worth noting- RCI was noted as not responding, but I believe they and Celebrity are owned by the same company, so I am guessing the responses for Celebrity and RC would come from the same PR department. I have never felt discriminated against on a ‘straight’ cruise, and the one time I did go with my partner at the time, I noticed no negative treatment from the staff or guests (though they may not have had any reason to suspect the nature of our relationship within the mixed group we were with). I have most often travelled with a single straight male friend, whom many could make the same assumption about the nature of our relationship, and experienced no ill treatment. I will say, much is what the guests make of it. I have occasionally attended their LGBT gatherings, and if no one shows up, that’s not on the cruise line. Also, I don’t care for the presumption that just because I’m gay, I’m going to want to specifically hang out with other gay cruisers for the duration of the cruise (ie being gay doesn’t automatically mean we have other shared interests or will naturally get along). I have had far more luck making connections over the dinner table with random people that the cruise has grouped us with – though inevitably I must come out to them and explain that the guy I’m with is not my boyfriend (because people assuming he is gay could shut him out of making a connection with a eligible bachelorette). 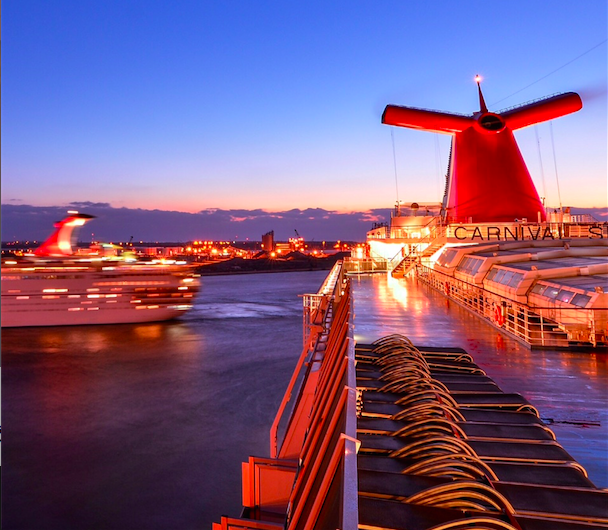 The reason I love cruising so much is because it is truly what you make of it. If you wanna stay in your cabin all week, sure, you can. But minimally there are usually out and proud staff that you could reach out to that welcome conversation (hey it’s their job) if you crave lgbt interaction. I am a ‘bear’ in the gay community, and that tends to not be a desired type in large LGBT groupings where I can feel isolated and unattractive (in general, many people gravitate towards ‘the ideal’, of which I am not, but I offer no indictment of any specific person or their acceptance of others). One day, I may try a gay cruise, but I fear it may be just as isolating as going out to club on a Friday night, where there are many who don’t share my ideals or ‘lifestyle’ as a professional 30something shy guy. My husband and I have been on over 40 cruises,,,and NEVER had any problem on Carnival, Holland American, Princess, NCL, RCI and Costa. We started in 1976 and loved cruises. we have always spoke with table mates. When we told a straight couple that we have been together over 47 years, she smiled that we did better than herself, she was on her third husband! We were always respected and we respected all cruise mates male as well as female. We follow the GOLDEN RULE, and expect all peoples follow the GOLDEN RULE, GAY or STRAIGHT! Thank you so much for sharing and congratulations!